Cowles Pavilion	This open-air gathering space is part of the Minneapolis Sculpture Garden, and is designed to accommodate a range of uses and activities. 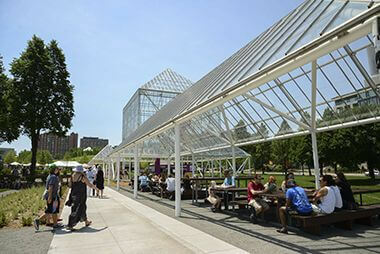 Originally built in 1988 as a conservatory, the facility was renovated as part of the Minneapolis Sculpture Garden reconstruction project to allow for more flexible uses in ways are more ecologically sustainable and energy-efficient. Located on the West side of the Minneapolis Sculpture Garden. The facility has a large main square with wings extending to the north and south. 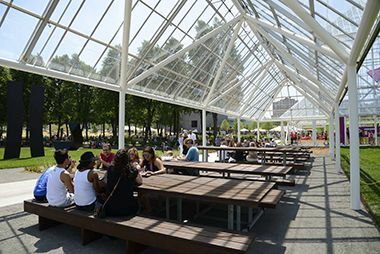 Large tables with benches are available for picnics and gatherings. The space is designed to be flexible and accommodate a number of uses and activities. 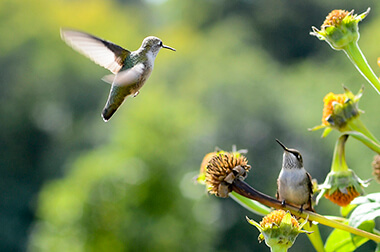 Our 12 gardens offer inviting spaces to explore, relax, and learn about the environment. For information on special events and weddings at Cowles Pavilion and elsewhere in in the newly reconstructed Minneapolis Sculpture Garden, please contact Customer Service. By the time David Fisher became park superintendent in 1981, the landscape had changed. Fisher had become the third superintendent in three years and the recreation building boom was over. With the economy in bad shape and a tax-payer revolt gaining steam, the park board faced limited resources to pursue any projects at all. The primary focus of the park board at the time was on developing the central riverfront, which would be accomplished primarily with funds from the state. The park board was also coming to terms with a very critical report issued in 1977 of what was considered its overwhelming emphasis on sports in its recreation program. Against this backdrop, Fisher received a call on his second day on the job as park superintendent from a man he had never met, Martin Friedman, who was the director of the Walker Art Center. Friedman proposed a lunch meeting to discuss possible collaboration between the park board and the Walker. What Friedman had in mind was the open grass field across from the museum. Friedman had the solution for the park board’s lack of funds to develop the property at a time that Fisher had characterized the park board’s financial position as “grim.” The Walker had a prodigious ability to raise funds privately from arts patrons and foundations. So the idea of a sculpture garden was born. The project came to life when Friedman secured a grant of $2.3 million from the McKnight Foundation to develop the project. Other contributors were soon lined up not only to develop the land, but to acquire sculpture to fill it. Frederick Weisman contributed a million dollars for the centerpiece of the garden, which has become a Minneapolis icon, Spoonbridge and Cherry, created by the husband-and-wife team of Claes Oldenburg and Coosje van Bruggen. Sage and John Cowles contributed another million dollars for the construction of a glass conservatory on the western edge of the garden (which also served as a cold-weather walkway from the Parade Stadium parking lot to the Guthrie and the Walker) and is the home of the soaring Standing Glass Fish by Frank Gehry. Kenneth and Judy Dayton donated a million dollars for the purchase of sculptures. The Regis Corporation, Dayton Hudson Foundation, Bush Foundation and Kresge Foundation each contributed more than a quarter-million dollars for additional development. 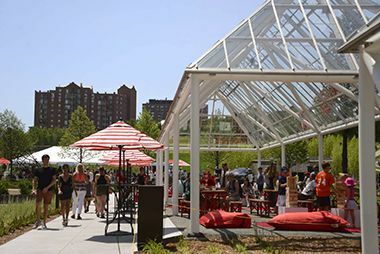 In addition the family of Irene Hixon Whitney contributed $800,000 for the design and construction of a pedestrian bridge, designed by Siah Armajani, which finally linked Loring Park to the new sculpture garden.